Kermit the Frog, the world's most beloved frog will be honored for the 50th anniversary of his meteoric rise from the swamp to international icon. For that honor, Kermit the Frog is taking a world tour to visit his fans around the globe. 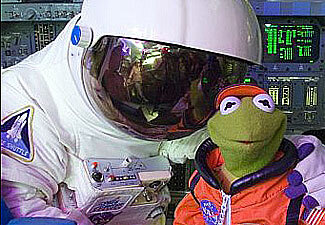 After kicking off his tour in Kermit, Texas on October 14, Kermit headed to NASA's Johnson Space Center. Kermit co-pilots a space shuttle at NASA Space Center Houston. He also participated in a special VIP tour of historical Mission Control. NASA embraced Kermit's arrival by inviting local Houston children to an anniversary celebration for the world's most beloved frog, including a question and answer session with Kermit and a screening of the galactic adventure, Muppets From Space. Attendees had the opportunity to have their photo taken with Kermit. While at Johnson Space Center, Kermit the Frog experienced a variety of out-of-this-world activities typically reserved for astronauts, including "walking" on a lunar landscape and sitting in the pilot's seat of the Space Shuttle.